The Day it rained hearts: Shapes of hearts - circle, square..
Have you seen raining hearts? The story is about a girl named Cornelia Augusta and her walk in the downpour of hearts. Without a thought the girl catches the hearts. When she gets back home, She thinks may be it rained hearts for Valentine's day and makes Valentine cards for her friends with her collection of hearts. Each heart is different size and she makes 4 different cards for her 4 precious friends - Dog, Mouse, Turtle and Bunny. She sends the cards to them. We liked the way she designed different cards suitable for her friends. A collar of hearts for the Dog, Cheese heart for the mouse, Symmetry heart art for the turtle and a pom pom heart for the bunny. It didn't rain hearts after that year but Cornelia Augusta found different ways to make her Valentines. CJ chuckles every time I read the title and she also loves the picture of raining hearts. 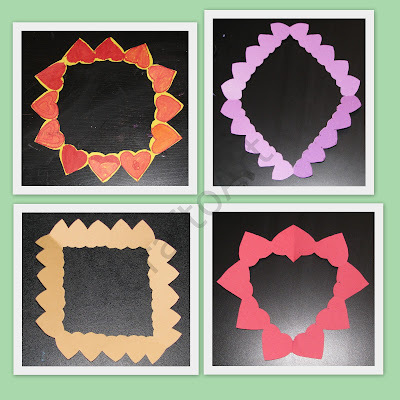 For the craft, We made different shapes of hearts by using a simple fold and cut method. Take a construction paper fold it in half, horizontal direction and then half, vertical direction. Using Cookie cutter or free hand draw hearts as shown touching each other and the hearts in the sides overlapping over the folds. Cut along the outline without cutting the touching hearts and the overlapping folds just like the dancing dolls or string of hearts. CJ loved the circle of hearts so much that she wore it as a Tiara! All those hearts how lovely! And the book does sound adorable. What a cute book and craft! Especially love the tiara! what a creative craft! I like those. Hi Esther, stopping by from Colours Dekor link party. Great idea! I love the heart made with hearts!! Thanks for sharing. I'm excited to be your newest follower, and LOVE if you stopped by my blog.